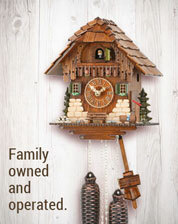 New Hubert Herr Model. 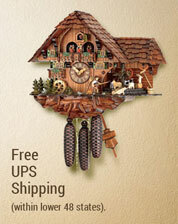 This 16 3/4 inch cuckoo clock features a 3 dimensionally carved stag on top with wooden antlers. 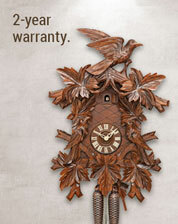 Clock also features nice carvings of birds and oak leaves. 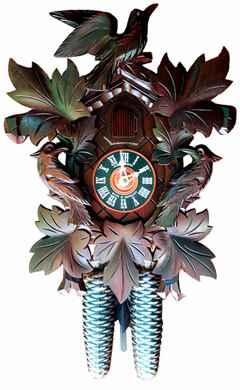 The carved solid wood hands ( an Herr exclusive feature) , wooden dial and wooden cuckoo bird add to the overall beauty of this great clock. 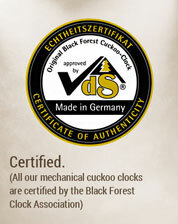 Clock is equipped with a German brass 8 day movement by Hubert Herr with manual night silencer lever. Solid metal chains and cast iron pine cones.